If this is the first time you have ever stayed at a B&B you probably have questions about what to expect. We are happy to provide the following information and if you still have more questions, don’t hesitate to ask. We want you to be comfortable with your selection of our B&B and it is a lot better to get answers now than to leave your precious getaway time to chance. So, first let us get rid of any preconceived notions that you might have about B&B’s in general. As Innkeepers we have heard it all when it comes to myths about B&B visits and owners. Some of the misgivings can be quite amusing while other myths have hung on for decades and simply won’t let go. So, here is our attempt to “bust” some of these myths about B&B’s. You have to share a bathroom. FALSE. Each of our rooms has a private bath. And just like our guest bedrooms, the bathrooms are unique too. We have invested in luxury spa-like bathroom upgrades that include jetted tubs and plush robes. Visit the rooms page on the website to determine which amenities are to your personal liking, since each room is different. All our bathrooms have a shower and a tub, not a combination of the two because we dislike fighting a shower curtain as much as anyone. To be licensed as a B&B, the building has to be historic. FALSE. The Speckled Hen Inn was originally built in 1989 as a family home and converted to a B&B in 2000. We bought it in 2016 and have continued most of the traditions that came with it and, of course, have added our own. 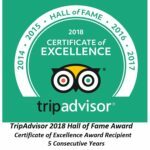 It is decorated the Inn in an eclectic mix of traditional, contemporary and modern country styles and are recognized as one of Wisconsin’s “Top 10” eco-elegant destinations. The interior and 20-acre grounds have a “country estate” feeling which guests find comfortably relaxing and private. The rooms feature HD televisions, DVD players and, WiFi. This is a unique property designed and built by the Innkeepers as our way to “live the dream”. It is a 30 year project that just gets better every year. Our pricing policy is simple. We price the rooms to cover the expenses of owning and maintaining our 20 acre property located just outside of Madison. The Innkeepers have retired from Corporate-America and are proud to now be an “American Small Business”. We focus our efforts on “sustainability” and support our local community business owners. Our locally produced foods are featured in our multi-course breakfasts, which is included in the price of the room. As a contrast to many hotels we also provide you with free wifi, free parking, and complimentary beverages and snacks. You can even borrow a movie from our collection and watch it for free and have a bag of popcorn too. B&B owners don’t prepare the breakfast themselves. FALSE. We consider ourselves self-taught gourmet chefs and love perfecting recipes or coming up with new ones on our own. If you read our guest reviews on TripAdvisor you will see that the breakfasts are routinely highlighted as “outstanding”. Breakfasts are prepared fresh each day, with our own or locally produced ingredients, and served at 8:30 or 9:30. You must eat breakfast with strangers. FALSE. You may interact as much or as little with other guests and the innkeepers as you choose. We have two dining rooms and two routine breakfast times, so you may do whatever suits your preference. And please don’t hesitate to indicate your preference to us. We will even deliver breakfast to your room for an additional fee if you choose one of the suites (Madison Lakes or Heywood Hardy) which have in-room dining tables, or in warmer months, on the balcony for the Starkweather Creek Room or in the gazebo. Frankly speaking, chatting with other guests at the breakfast table is a highlight of many visits. Guests often find that they have so much in common with other folks at the table and even if they don’t it is fun to share tidbits of information about what you have seen and done during your visit to Madison. Innkeepers prefer not to be asked questions. FALSE. We do this because we enjoy talking to people. People who stay at B&B’s are unique and extremely interesting folks. We are proud of what we have to offer to our guests and sharing our story of acquiring the inn as well. Many guests have entertained the idea of someday owning a B&B and want us to describe what it is like to them. We also know our community and are actually honored when you think of us as your personal concierge. 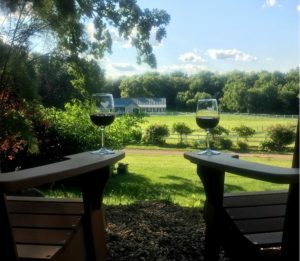 Let us help you with boutique shopping suggestions, restaurant recommendations, winery tours, Madison’s must-see attractions, and directions to the best hiking and biking trails in the area. So, ask away! That said, we are not going to hover around you during your stay. We respect your privacy and space. If you need us or want to talk with us, we have our cell phone numbers clearly posted for your use. Check-in begins officially at 3 pm and checkout is at 11:00AM the following day. Other than that, there are no “rules”. Each room has its own locked entrance and the main door has a secure entrance with an access code that will be provided to you upon arrival. There’s a front desk staff available 24/7. FALSE. As Innkeepers we serve as chef, housekeeper, gardener, farmer and maintenance person all rolled into one, so our job will take us away from the “office” for brief periods of time. When you enter the Inn, our cell phone numbers are on the counter, so just call if you do not see us and we will be there in a couple of minutes to greet you and check you in. When making a reservation, you’ll typically be asked for your estimated time of arrival. As a courtesy, if you are going to be late or early, just call so that that we will be available upon your arrival, especially if you are going to be arriving after 6 pm. For check out, just come to the office near the dining room the following morning and we will settle the bill. Innkeeping is a hobby. FALSE. As innkeepers we left behind full-time 30+ year careers in the corporate world to dedicate ourselves to what is often a seven-day-a-week job. We do this because we want to and love what we are doing…it is a labor of love and having you as our guest validates our passion for innkeeping. This property wouldn’t be nearly as rewarding to us if we couldn’t share it with others. B&Bs are not for business travelers. FALSE. Many of our best customers are business travelers and have been staying with us for years. We offer breakfast at the time of your choice, in-room desk, WiFi and other essential business related services. Pretty much just like a hotel, but without the “cookie-cutter” atmosphere! If you have never stayed at a B&B and your co-workers are telling you that they had such a wonderful time at a special B&B in Madison last weekend, it might have been The Speckled Hen Inn. Guest referrals are a major source of new business for us. This sounds interesting but you have no idea of what to expect and you have a few questions. Here are some of the questions that we as innkeepers hear frequently and our answers. If you have more questions, just call. We want only satisfied guests who will feel that their stay “exceeded expectations” each and every time that they visit us. So email us or pick up the phone and call. We would love to answer your questions. We have never stayed at a B&B, what is it like? We invite you to visit TripAdvisor.com and read the reviews of our guests regarding the Inn. Personally, we strongly believe that The Speckled Hen Inn is not just another Bed & Breakfast. It is a unique property and referencing the reviews sited above, you will get a few hints of what to expect. It is special. Reservations are required. This is a boutique property with only 5 guest rooms. Weekends book early, so making a reservation a few weeks in advance is highly recommended. May – October are our busiest months. UW graduation, football weekends and New Year’s Eve usually book a year in advance. Please call or email the innkeeper as soon as you find out that you need to cancel. The official cancellation policy is that cancellations must be made 48 hours prior to your arrival to avoid a substantial penalty. The policy is clearly stated on the website and will be included in your confirmation email. Please understand that we are a small business and your cancellation means that we instantly have lost 20% of our income for the day you are cancelling. Our staffing and meal planning is done in advance of your arrival. So, even though our policy says 48 hours, we certainly appreciate knowing if there is a change in your plans very soon after you know yourself. Relax, enjoy yourself, and have fun! But remember that others are trying to do the same thing so please be respectful of others desire for privacy, relaxation, quiet and comfort. You set your own schedule and come and go as you please. If you return to the Inn late, please be mindful that there may be others sleeping so respect their desire for quiet. We strive to be as eco-friendly as we can possibly be. We have cats but they are not allowed in the Inn. Cleaning products and bath amenities are selected for their natural ingredients. Our bath amenities are in sealed dispensers. Scented candles are not used at the Inn and we prefer the scent of freshly baked cookies and breakfast coffee to anything that you can buy at a store. Do be aware that the Inn is located in a natural setting which means that pollen and dust do surround us. I have special dietary needs, can this be accommodated? We are accustomed to preparing breakfast for folks who are diabetic, gluten free, allergic to eggs, dairy products, vegetarian, vegan and a host of other food allergies, sensitivities, and just plain old dislikes. If your list of food issues is long and extremely challenging, just let us know what you normally eat for breakfast and we will take it from there. We don’t want to make you sick. We want you to leave our table happy and well fed. Preparing a special breakfast is never an inconvenience. Calling the paramedics would be. Breakfast times are routinely at 8:30 and 9:30 AM. We will ask you to select a time when you arrive. Other times may be accommodated depending upon occupancy. Also, if breakfast just is not your thing, let us know. We don’t believe in force feeding our guests. A light breakfast of fruit, yogurt, granola can be served. Do I order breakfast off a menu? No, at The Speckled Hen Inn we serve a plated breakfast entrée of the day. We plan our menus based on the dietary needs of our guests and the abundance of seasonal breakfast ingredients and appreciate learning of dietary restrictions and allergies in your reservation rather than at the table. There are some sample breakfast menus on our web site. State regulations require that an approved bed be provided for each guest. Also as a matter of policy, children under the age of 12 are not allowed unless the entire inn is rented by a family group. Some of our rooms will accommodate more than 2 people (please see the website). Many guests tell us that we have thought of everything when it comes to furnishing and equipping our rooms. We do supply hair dryers, shampoo and conditioner, make-up remover towels, irons and ironing boards, robes and all the bed and bath linens you will need. Our library is well stocked with books and magazines. There are games and puzzles and movies to entertain you too. Please leave any candles at home. Complimentary coffee, tea, soft drinks, pretzels, popcorn, and cookies are available. We do have a wine list and offer a variety of wines for sale to our guests. There is a small refrigerator in the gathering room that guests can use to store dinner left-overs, meds that need refrigeration, or bounty from the farmer’s market. Certainly! But please remember that you are sharing this space with other guests and don’t let your enjoyment compromise theirs. We do require that only registered guests be on the property between 10:00PM and 7:00AM and that you, as a courtesy, let us know if there will be friends or family, other than registered guests, here at other times.